Cars are too complicated, a pain to work on in many ways. But a lot better than buildings and homes. Still, nothing is simple to unbolt/unscrew and replace. Check out the heater on my MR2. The slider for the temperature control was stuck. 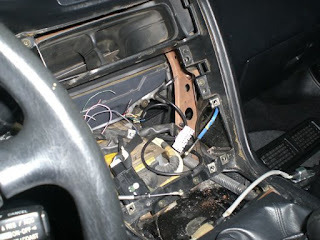 After completely tearing out the center console to pull the HVAC panel out (along with the stereo, cigarette lighter, hazard light switch, and vent ducts) I got to the bottom of it. Hopefully it’ll all go back together ok. This is a good illustration of the basic problem. Things aren’t made to be replaced. The whole vehicle is. There should be clearer boundaries between subsystems, making it easier to replace specific components. Take my MP3 player. I can plug it into a computer with a USB cable and swap files between the two, as well as charge it. Then I can plug in earbuds when I’m out and about or I can hook it up to speakers when I’m home. There are very few things to break or fail with solid state electronics. If something fails, I just get a replacement. 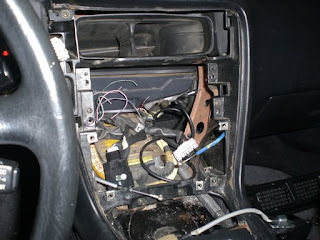 The HVAC controls in a car should be like that. The old school way of a bunch of wires and cables, while generally reliable, is out of date and a pain to work with. Imagine if you could dissect a car almost as easily as a Lego set. There’d be a lot less scrap because cars would last longer and be easily upgraded. Like remodeling your house without the hassle of redoing drywall. This is what I meant in this previous post.